I share my home with my 4 pibbles, they are all from shelters. 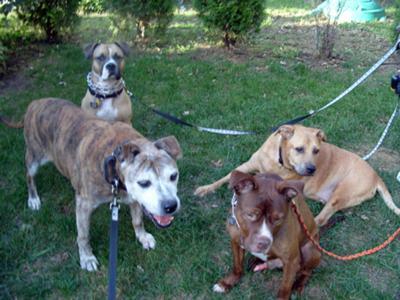 Skippy, the oldest is a pit-rotti mix. Judge Miyagi (Miggy), is the white faced brindle he's about 11 years old. He was adopted in 2010. Louis is the red. He's about 2yrs old and Simon is the buckskin he too is about 2 years old. Oh, let's not forget how much they love going to see their Doc! I watch the other dogs in the waiting room cringing...these guys, see the vet and stand up waiting to be called! They are well adjusted spoiled brats with loads of energy, snuggling and goofiness! Congratz on your doggy bliss! Congratulations! Not everyone is capable of bringing a pibble into their home and treating them like family. But you've done it FOUR times! Not only that, but you adopted a senior pibble! You have no idea how rare that is. I am so happy for you and your furry family! Cheers to you and I wish you many many many more years of healthy happiness with each of your current and future four-legged children!